SRID is a tedious and time consuming assay to perform. Why not let InDevR’s team of scientists do it for you? The single radial immunodiffusion assay is used to quantify the concentration of antigen in a given sample relative to a standard of the same antigen. In short, an agarose gel is infused with reference antisera and holes are punched in the gel. Antigen is placed in the holes and diffuses into the agarose. The distance that the antigen diffuses into the agarose is measured as a precipitate “ring” in the gel after staining. The ring diameter is proportional to the quantity of the antigen present in a given well. The SRID assay is applied across the influenza vaccine industry. It is widely used to determine the potency of the hemagglutinin content of vaccines prior to release of the product. InDevR has scientists trained and experienced in performing the SRID assay to specifications put forward by the FDA. This assay can either act as a calibration for the VaxArray assay or can be performed for stand-alone potency determination. VaxArray influenza Potency Assays have been shown to correlate well with results from SRID assays. 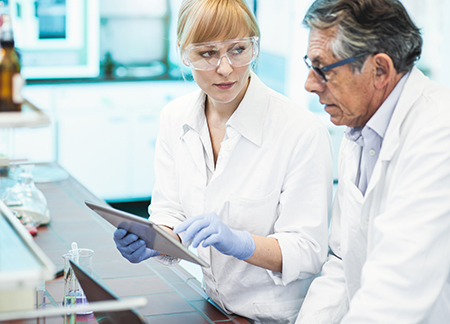 Contact InDevR to connect with our scientists for help in defining the testing plan for your samples.